All GM LS Gen III or IV engines equipped with LS1/LS2/LS6 style cathedral port cylinder heads. Includes mounting bolts & washers as well as pipe plugs for Manifold vacuum and MAP sensor ports. 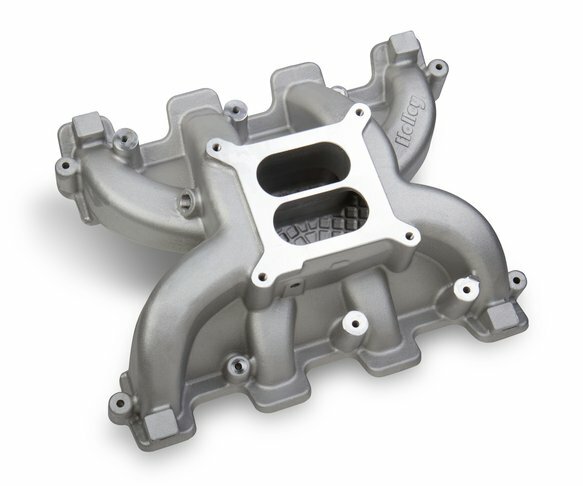 NOTE: These Dual-Plane Intake Manifolds are NOT legal for sale or use on engines with pollution controlled equipment. Got an LS engine to get running? Nothing is easier than bolting on a carburetor. Holley's dual plane carbureted intake for GM's LS engines will help you get on the streets quick! Its dual plane design makes it perfect for low end torque, yet it still pulls all the way to 6,500 RPM! Our O–ring cylinder head mounting flange gaskets provide an OEM style seal and make installation a snap. Bolt one on today!